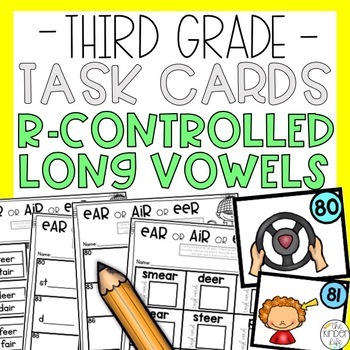 This is a 12 card r-controlled long vowels (air, ear, eer) reading task card game with 4 different recording sheets! 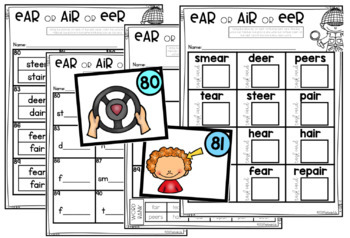 Students will practice reading, identifying, and writing r-controlled long vowels (air, ear, eer) in many different ways! 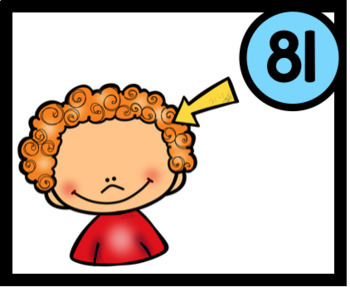 Get your students moving and having fun with this reading task card game! My task card games can be used as a whole group activity, small group activity, math or literacy center, independent work, or as a FUN brain break activity. ☆WANT ALL of my Third Grade Task Cards for FREE?! They are ALL included for FREE in my Third Grade Sub Plan BUNDLE! -Each task card game can be used with a pencil/crayon and paper OR put into a sheet protector and used with a dry-erase marker! -Easily differentiated! This task card game includes FOUR different recording sheets! If you have purchased this monthly sub plan or the bundle, you WILL own ALL my task card games!